But Independence Day is not all solemn remembrance; it’s a day for unabashed, patriotic celebration. So, to add to the fun, we offer a short list of fun facts and Fourth of July trivia to entertain you and your family. Boston patriot John Adams wrote to his wife, Abigail, predicting the date would be “celebrated by succeeding generations as the great anniversary festival. It ought to be commemorated as the day of deliverance, by solemn acts of devotion to God Almighty. It ought to be solemnized with pomp and parade, with shows, games, sports, guns, bells, bonfires, and illuminations, from one end of this continent to the other, from this time forward forever more.” But he was talking about July 2, the day the Continental Congress voted to approve the Declaration of Independence, not July 4. There were 56 men who signed the Declaration of Independence, but only two, John Adams and Thomas Jefferson, would go on to become president of the United States. Both Adams and Jefferson lived to a ripe old age, dying within hours of each other on the same day, July 4, 1826, the 50th anniversary of the signing of the declaration. Adams’ last words expressed his consolation for the country in the fact that, “Thomas Jefferson survives.” But, Jefferson, though younger by seven years, had already passed on. On July 4, 1776, we were a nation of about 2.5 million people. Today we number more than 341 million. In 1781, months before Washington’s victory at Yorktown finally secured independence, Massachusetts became the first state to make July 4th an official state holiday. The first Independence Day observance west of the Mississippi River took place in 1805 at Independence Creek, celebrated by Lewis and Clark. On June 28, 1870, Congress voted to make July 4 a national holiday. But it wasn’t until 1941 that Congress made the date a federal legal holiday, so government employees could have the day off with pay. George M. Cohan, the famous American showman who proudly declared he’d been “born on the Fourth of July,” was actually born on July 3. Famous Americans who were really born on the Fourth include New York Yankees’ owner George Steinbrenner, Lean on Me soul singer Bill Withers, North by Northwest actress Eva Marie Saint, The Scarlet Letter author Nathaniel Hawthorne, The Odd Couple playwright Neil Simon, Oakland Raiders owner Al Davis, cartoonist Rube Goldberg, Beautiful Dreamer composer Stephen Foster, and Vietnam War veteran and activist Ron Kovic. The only U.S. president born on the Fourth of July was Calvin Coolidge, who served from August 2, 1923 to March 4, 1929. 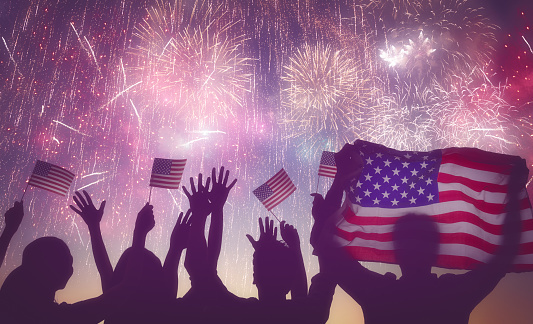 All of us at Marcari, Russotto, Spencer & Balaban, wish you and your family a happy and healthy Fourth of July.